Hiking is one of the best-known adventure activities around the world, but it can be quite different in Greenland. Maps can be difficult to track down and even the capital city is remote. You can quickly find yourself far from everything and stocking up on forgotten supplies is not always as easy as running to the corner shop. 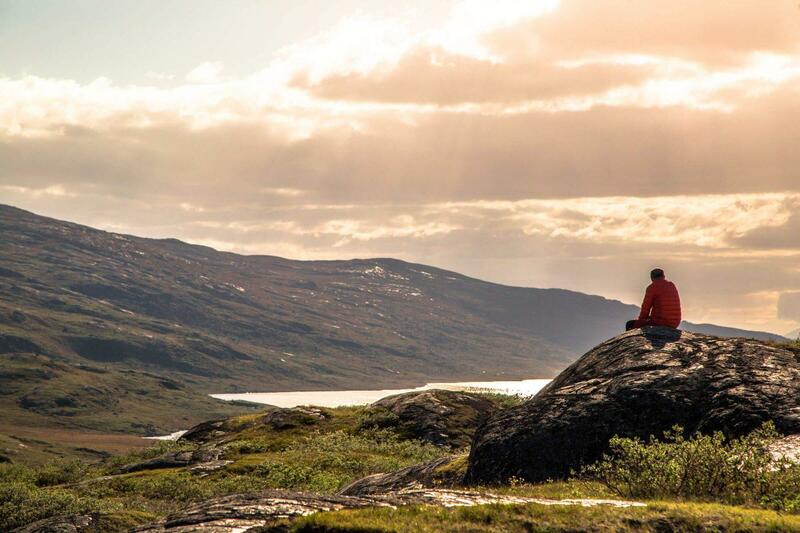 That is why we created this Ultimate Greenland Hiking Guide to be your go-to source about all things hiking in Greenland. A short introduction to the different words for a hike and how some are nuanced according to nationality or country. It helps you navigate the difficulty scale of nice-and-easy to extreme and will make it easier for you to pinpoint which routes in Greenland are best-suited for you. This short introduction sheds light on how sometimes hikes are called ‘walks’ and other times they are called ‘treks’. There are several terms for the activity of propelling oneself through natural landscape in a gorgeous destination. Sometimes the difference lies in personal preference, but other times, the nuances fall along nationality lines. 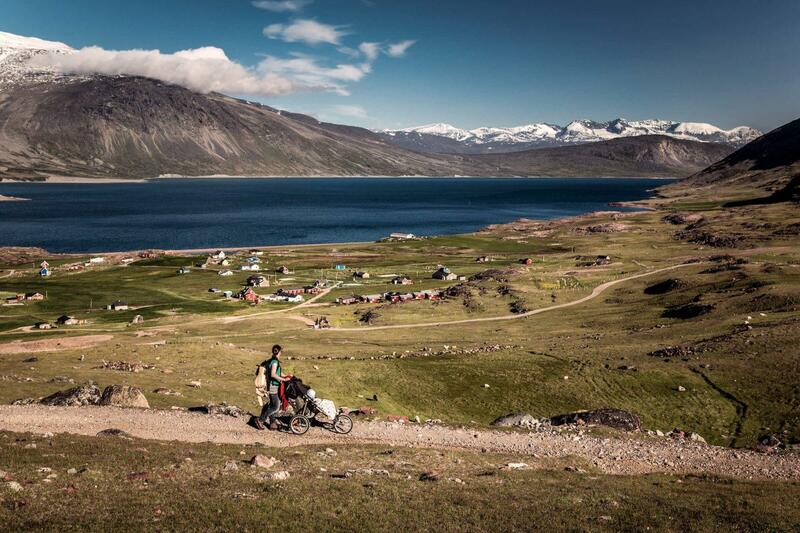 We admit we are prone to using the catch-all word ‘hike’, but in this Ultimate Greenland Hiking Guide we aim to give a more detailed look at the various opportunities for human-powered adventures in the Greenlandic mountains. 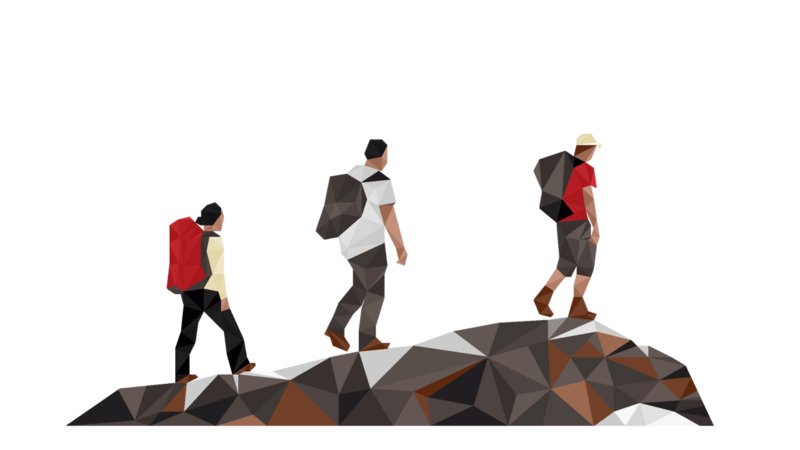 Here are the definitions for various hiking activities, based on difficulty level, we will use in this guide. In Chapter 3, you can find examples for these options. A walk is the easiest style activity. They usually occur on roads or boardwalks, but in some instances they could be on flat, very well-trodden terrain. Any ambulatory person can do a walk. Sneakers should be suitable footwear, and no other special gear or training is required. A hike involves moderate physical activity and always occurs on terrain. Hikes can last a few hours or an entire day, but they always start and finish on the same day. Though there is some elevation gain, a hike is about traversing distance more than going to the top of a peak. Sturdy hiking boots with solid ankle protection should be worn, and a daypack with extra socks and layers, snacks, a water bottle and so forth should be taken along. Hiking poles are up to personal preference. A summit hike is strenuous physical activity with the aim of reaching a mountaintop. 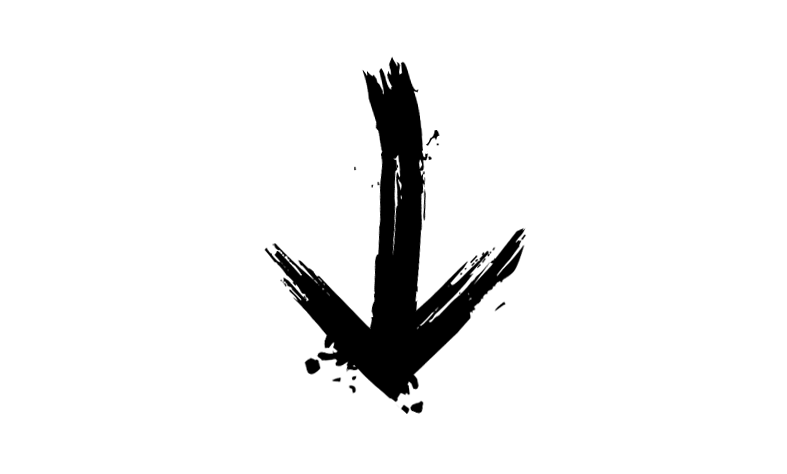 Thus, not much ground is traversed from one coordinate to another; all energy is put into gaining elevation. Summit hikes can last a few hours or an entire day depending on the mountain’s height, but they always start and finish on the same day. Sturdy hiking boots with solid ankle protection must be worn, and a daypack with extra socks and layers, snacks, a water bottle and so forth must be taken along. Hiking poles are up to personal preference. A trek is characterised primarily by its multi-day nature. It is comprised of several days of hiking in a row, and depending on the terrain and interest of the traveller, one or more summit hikes might also be included. Endurance and good physical fitness is paramount. Special equipment like a satellite or VHF radio, trekking backpack, tent, sleeping pad and sleeping bag as well as a food supply is required. Overnights could potentially also be spent in backcountry huts, where available. Hiking poles are up to personal preference. 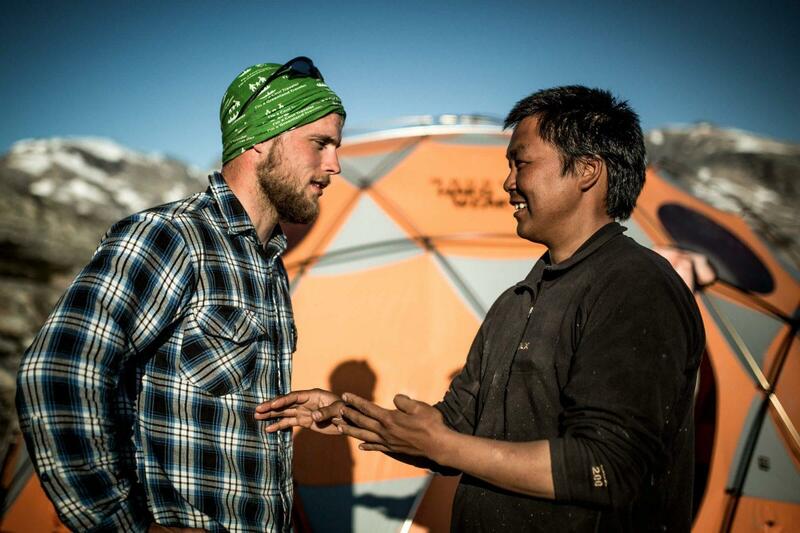 An expedition is primarily the realm of professionals and takes place in extreme remote areas. 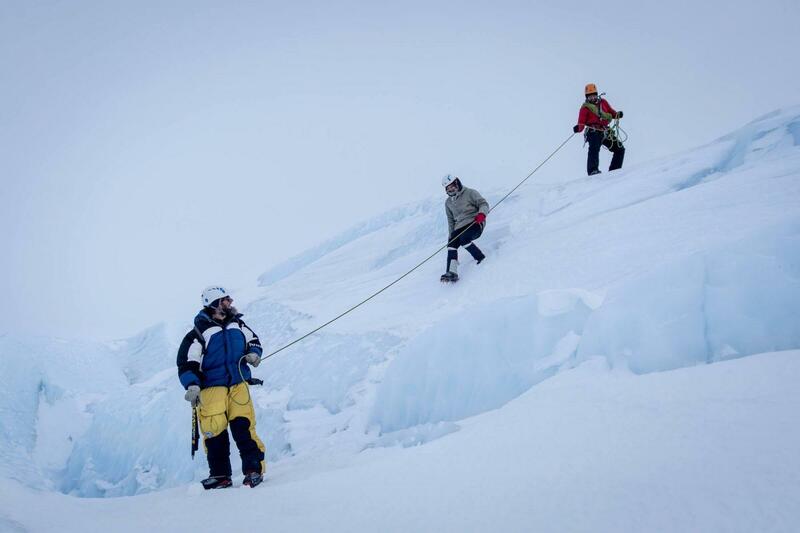 They involve highly strenuous physical activity for extended periods of time, and the activities usually go beyond just trekking to include mountaineering or rock climbing and glacier crossing. 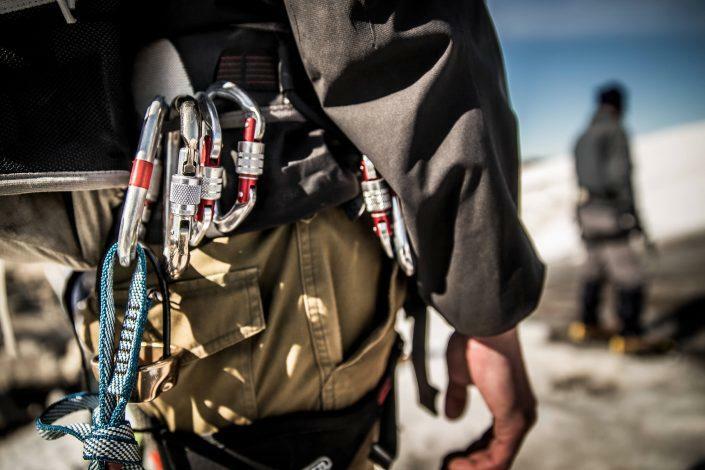 Fine-tuned technical skills, serious training and special equipment like crampons, safety harnesses, ropes and pulks are required. 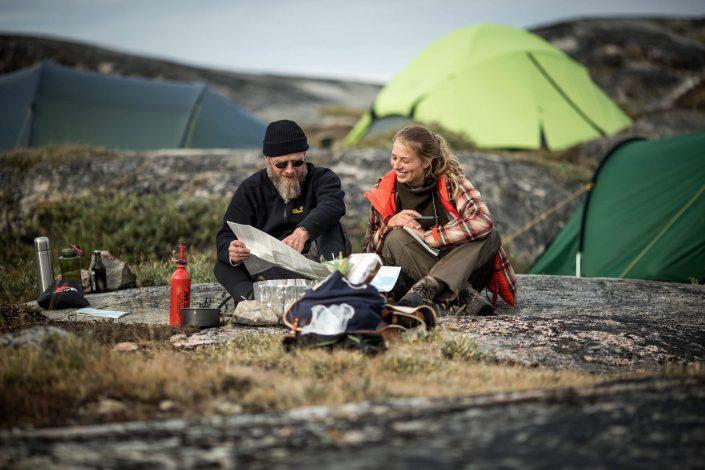 It would also be necessary to apply to the Government of Greenland for a Travel in Remote Areas of Greenland permit, if planning a private expedition without the services of a licensed provider. Knowledge is power, especially when out in the Arctic wilderness. Even if you are an experienced hiker, having someone with previous experience in Greenland leading the way can make for much smoother trail blazing. It might even help save your life. Even experienced hikers are newbies when it comes to exploring a new destination. 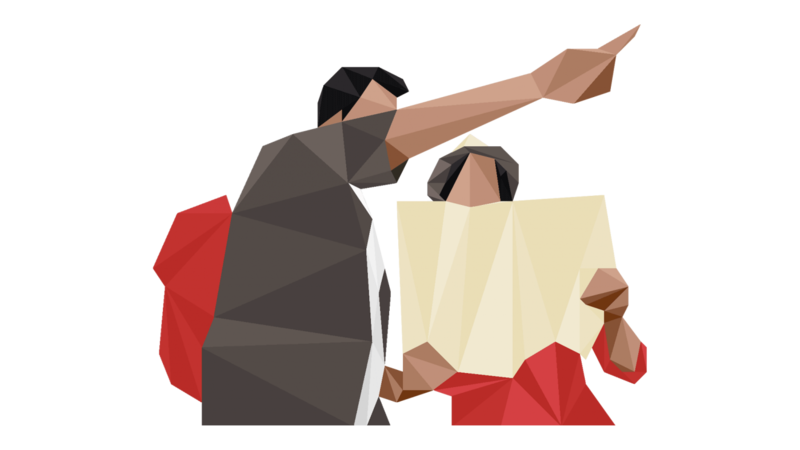 Do yourself a favour and take advantage of local guides’ knowledge. We have heard so many times that the hiking conditions in Greenland were much different than the hiker expected – more challenging to find marked cairns, softer ground, warmer temperatures, the list goes on. 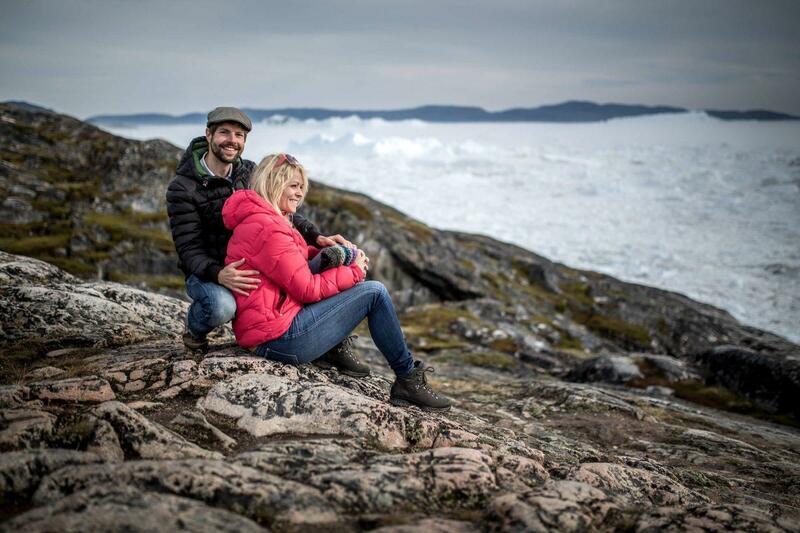 So why not set yourself up for success and hike with someone who knows their way around this particular Arctic environment? 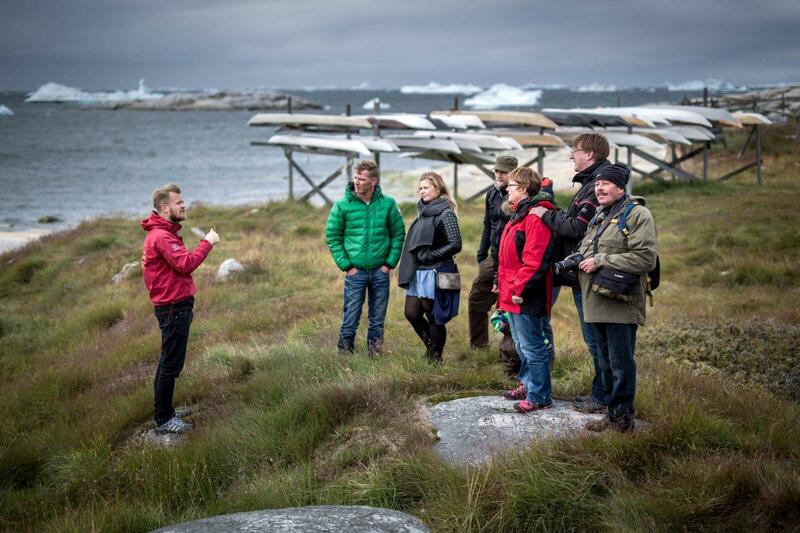 For walks, hikes and summit hikes, there are loads of operators who offer the opportunity to discover Greenlandic nature with local guides. And if you are considering an expedition, then we would absolutely only recommend that you conduct it alongside an expeditioner with great experience in Greenland. Here is a handful of fantastic reasons to hike in Greenland with a local guide. Over the years, guides have learned the land, sometimes the hard way. They know how it behaves at certain times of the year, like for example, that it gets intolerably wet and muddy within 15 meters of a particular lake in early summer. They also know a shortcut that the hiking map does not show you but which leads to a breathtaking view across the fjord. If you hike with the guide, you will probably have dry(er) feet and more wool socks in the reserve. 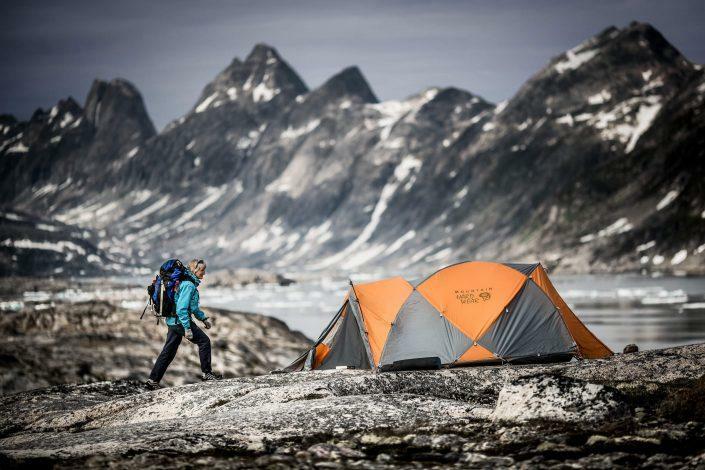 Let’s face it, there are a lot of trekkers in Greenland that land and start their backcountry adventure immediately, sleeping in their own tents each night and even bringing in their own freeze-dried food and fuel supply. 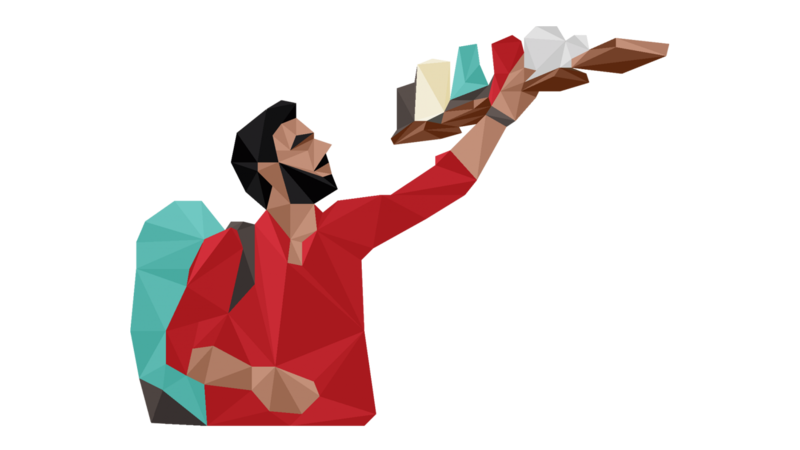 (By the way, you can actually buy outdoor gear, goods and food in shops all over the country). This type of self-sufficient trip does not really leave a lot of economic benefit in the country, aside from the plane ticket. 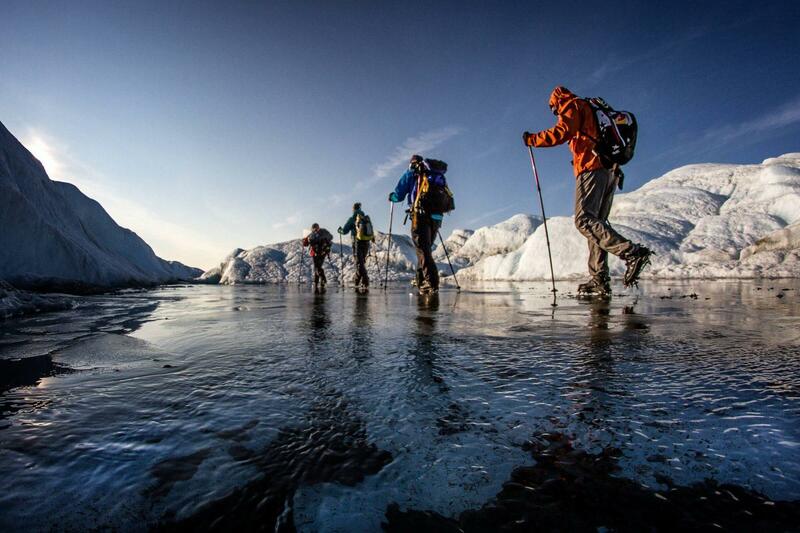 But by buying the service of a local guide, you could increase the positive impact of your adventure in Greenland. You can feel good about supporting the local community. Many places in Greenland require quite patient searching and waiting for wildlife, even if the area is teeming with animals. Short of being out for a long, multi-day trek, your few-hours’ day hike leaves only a small window of time to find the animals. Therefore, a guide who is out in the area every day has the best sense for where animals habitually spend their time so you can maximise your hiking time by going in the right direction. You increase your chances of getting that great wildlife shot and becoming the next Nat Geo photographer. A polar bear sighting sound like something everyone wants in theory – until it actually happens. Seeing a polar bear even from several kilometres away is enough to make an inexperienced person’s adrenaline go into overdrive. Like the local guides say, if you can see the bear with your naked eye, then it is too close. 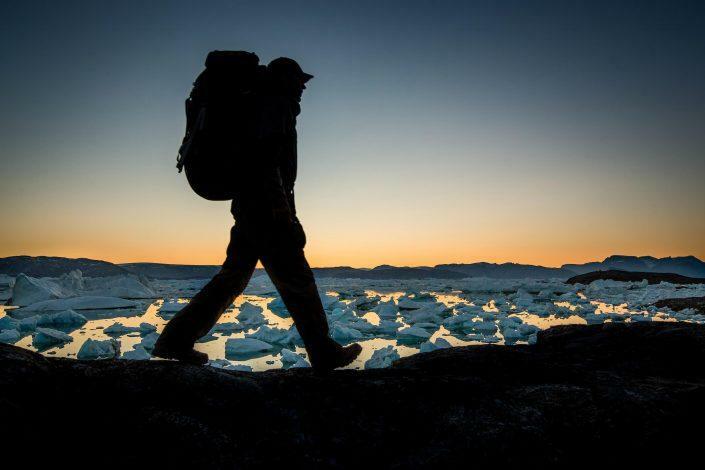 Of course, some areas of Greenland are more susceptible to rogue bears than others, but hiking with a trained guide who is licensed to carry a protective rifle gives peace of mind no matter where and when. You do not have to look over your shoulder every minute or set your own bear wire. In the case of a sighting, your guide will make all the decisions about what to do next and you can just resume to breathing normally. The crowberries and blueberries that blanket the Greenlandic hills can be so juicy and delicious that they often make locals out on a reindeer hunt forget about the animals for a minute. And a stalk of angelica or a handful of Labrador tea leaves make for the best cup of tea – be that right there on the trail or later in the evening back in civilisation. We won’t even mention the wonders it can do for the dark depths of a backpack on Day 5! But without a guide, you might not be able to identify the species, or perhaps you might be in doubt and pass up the opportunity. You will have a belly full of delicious berries instead of poisonous ‘Yeti fingers’, as Greenlanders call club moss. 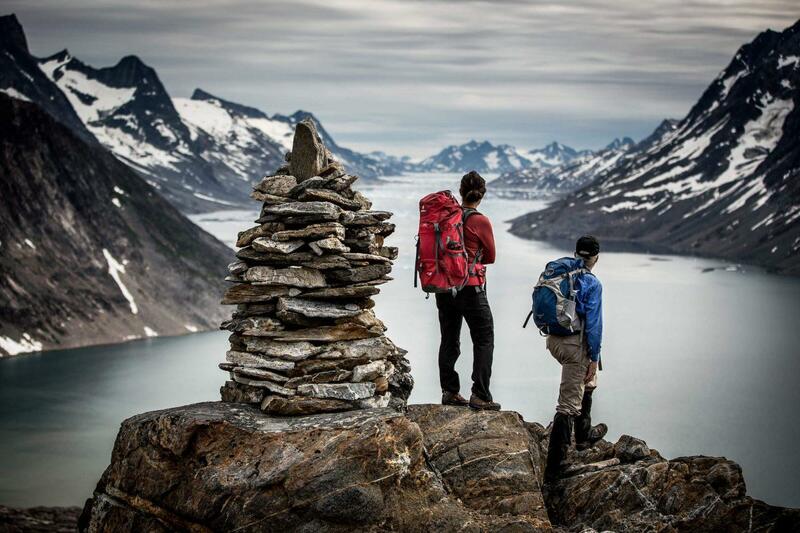 Greenland is a huge island with hiking opportunities from north to south and east to west. 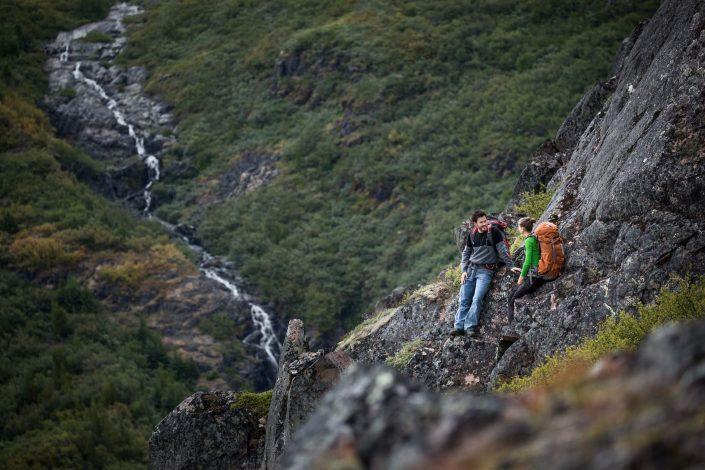 Find the best route for you regarding length and difficulty, no matter what hiking style you have. In a country where 99.99% of the land is pure uninhabited landscape, the hiking opportunities are manifold. Find the best ones for your style. 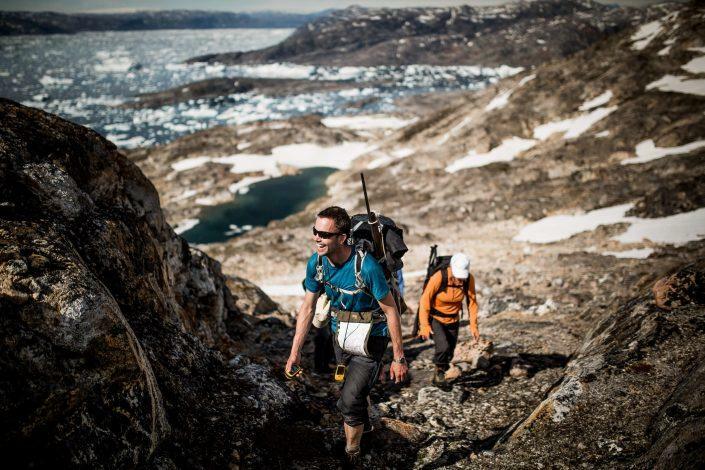 In Chapter 1 of this Ultimate Greenland Hiking Guide we identified the difference between 5 types of hiking activities in Greenland: walking, hiking, summit hiking, trekking and expeditioning. 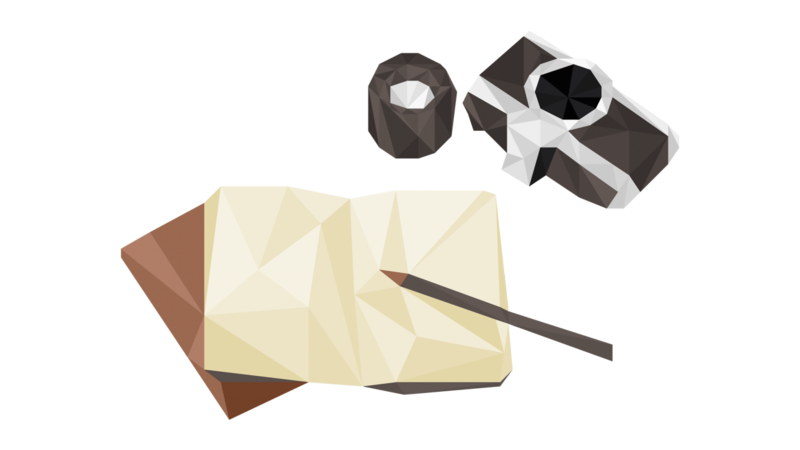 In this chapter, we offer some real life experiences for each type that you might consider. 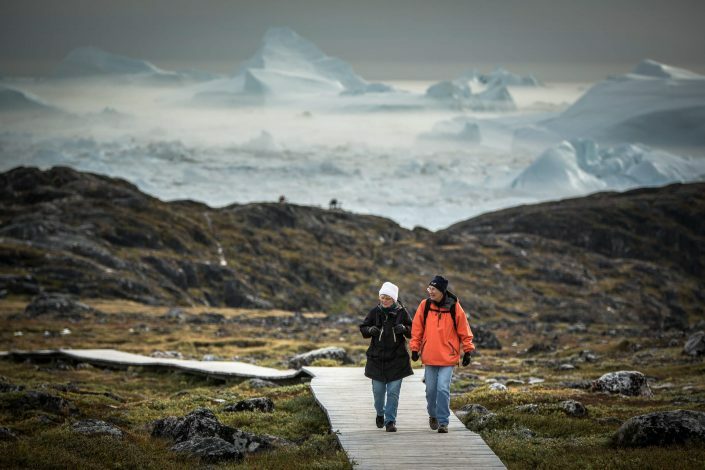 One of the most popular walks in Greenland is in Ilulissat. A plank boardwalk winds through the UNESCO World Heritage Site and out to the coastline, making it possible for literally anyone to see the giant icebergs at the mouth of Ilulissat Icefjord. The area is free and open for all, so this is a great self-guided option. However, the local operators below also offer the walk as a guided tour so you can learn about the history of the area and the old settlement which once existed where the boardwalk makes a turn. Additionally, every town has paved roads, so there is always the possibility to take a walk through the town to the museum, church or local boutique. It is also nice to walk by the harbour, which is a lifeline for the Greenlandic culture. 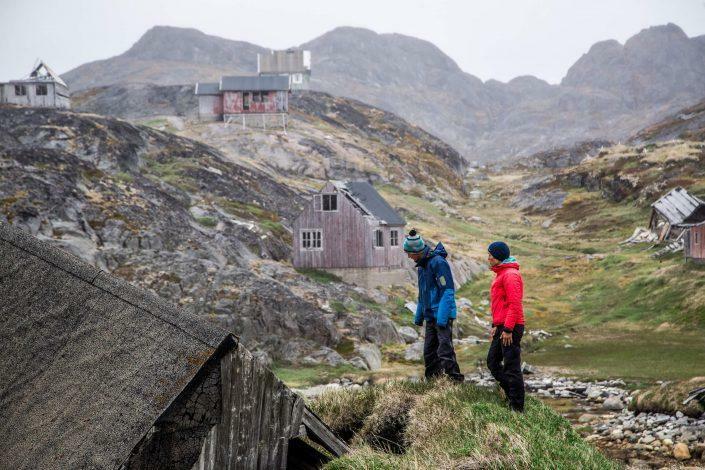 In theory, there are endless hiking opportunities in Greenland because the land is free and open for all to use without having to worry you are crossing someone’s private property. For those who want to follow a trail that is at least semi-trodden, here is a nice selection of common hiking routes, by town. 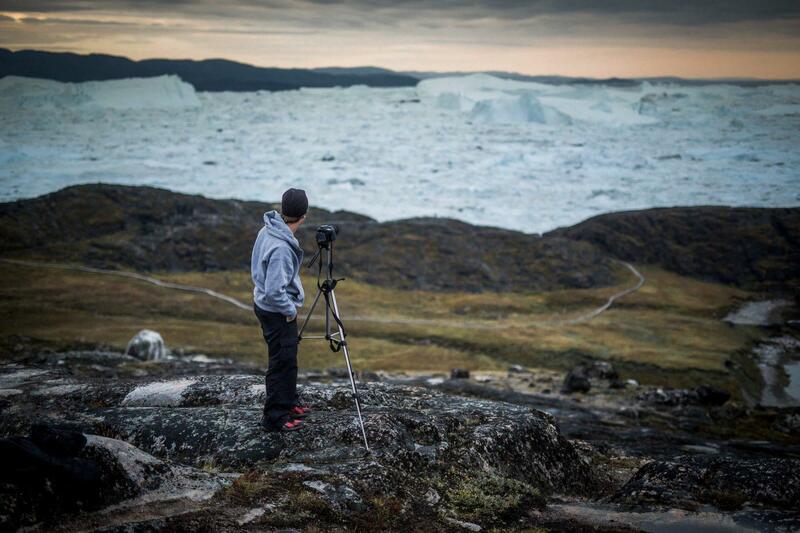 Ilulissat‘s majestic icebergs form the backdrop for the ancient Sermermiut settlement, 1 mile (1½ km) south of the town. 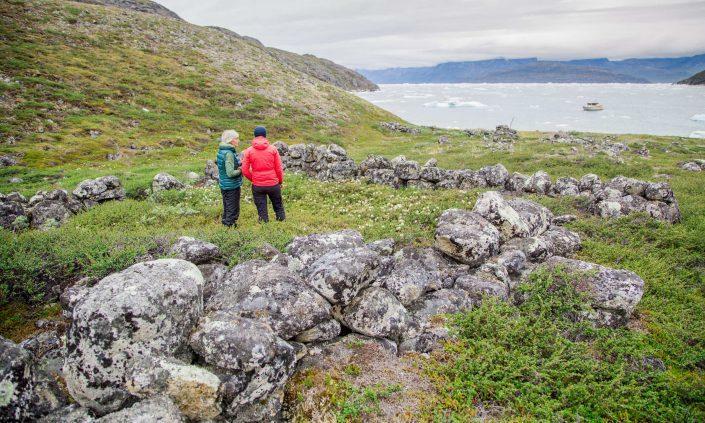 Learn about Greenlandic people’s lives and customs before the arrival of the Europeans—see the ruins, kitchen middens and feel the permafrost with your own hands. You can do the brief hike in 2 hours easily. At Eqip Sermia, the hike starts from the cottages and continues around the small lagoon at the glacier’s southern end. The lagoon is particularly famous for its huge flocks of geese during the breeding season. The trip continues up the impressive glacial deposit with breathtaking views down into the glacier’s enormous crevices just a few yards from the trail. This is also an opportunity to view a large portion of the 75-yard (70 m) tall glacier face and watch its awe-inspiring calvings. A longer hike that offers many different types of landscapes is the route that follows in the footsteps of Paul-Émile Victor, where—in the late 1940s and early 1950s—track vehicles and an old cableway carried supplies for Victor’s famous expeditions. In fact, some of his machinery is still there. It takes about 10 hours to hike the route and the level of difficulty can be said to be extreme. 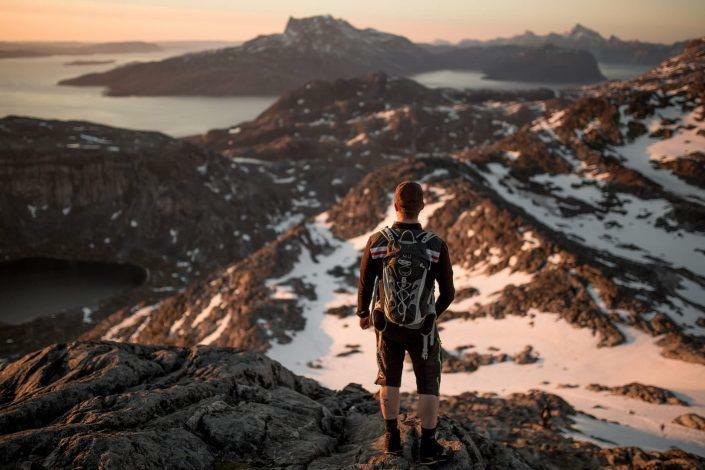 In the Arctic Circle region, one of Sisimiut’s most popular hikes is Palasip Qaqqaa (Priest Mountain). 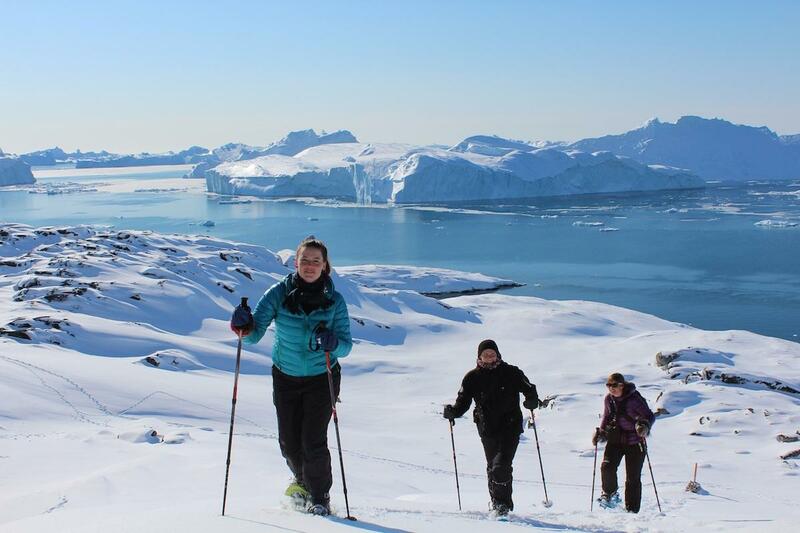 It can take up to 2 hours to get to the summit, which offers unbelievable vistas of the town and Kangerluarsuk Tulleq (First Fjord). 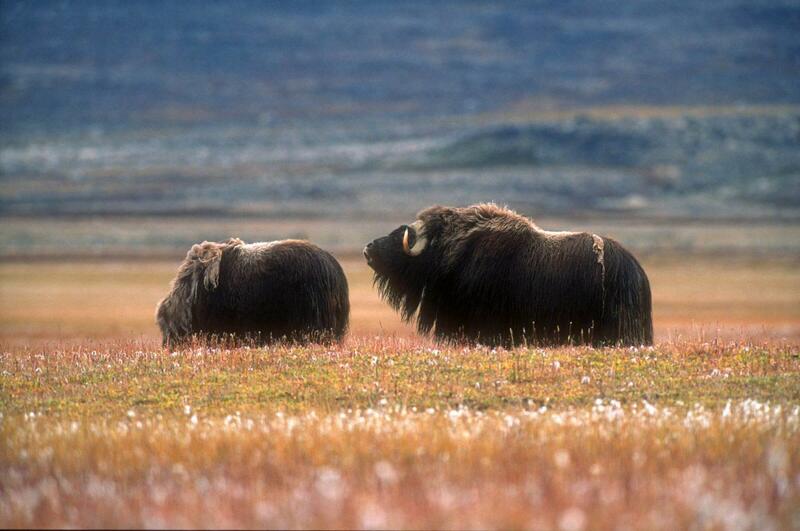 The last couple of years have even offered sightings of muskoxen. Nasaasaaq is the landmark of Sisimiut. It peaks at an elevation of 2,572 feet (784 m), boasting breathtaking views of the town, the mountain landscape, the sea, the polar circle and the alpine Itilleq Mountains to the south. Duration: 4–6 hours. 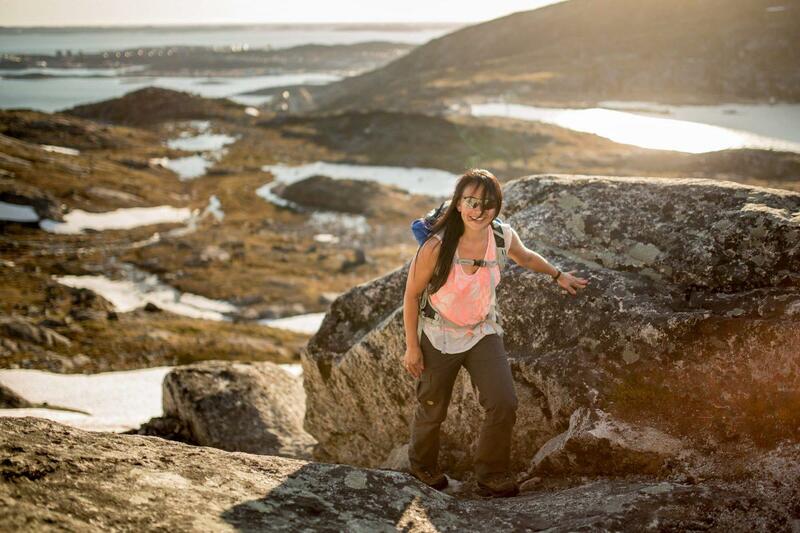 Nuuk also has some popular hiking routes. 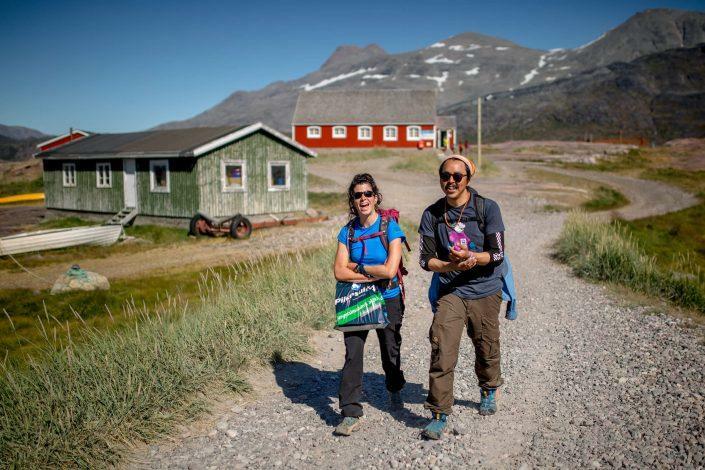 Hiking Quassussuaq (Little Malene) is pretty simple: It takes 4-6 hours and as long as you have Little Malene on your right all the way around, you will never get lost. If you are looking for a shorter easy hike but still want a fantastic view, hiking up to the top of Little Malene is an absolute must. It takes about 3 hours. If you have 7 hours to kill, another option is to hike to the peak of Big Malene. Be aware that this hike is a medium/hard difficulty level. In South Greenland you will find the 16 km long hiking route from Igaliku up to a plateau with a view of Qooroq Ice Fjord. The route will take you through birch vegetation, patches with bare rock formations and finally to the barren “moonscape” with timeworn rocks and stones. The hike is medium difficulty. 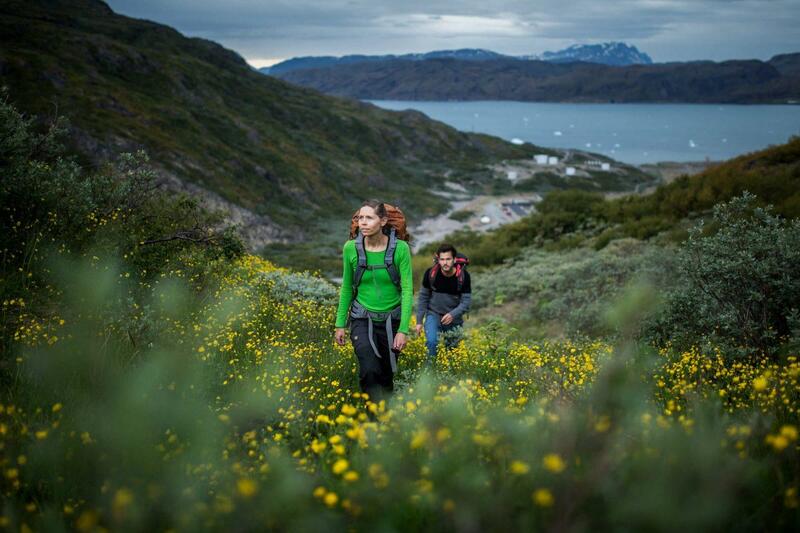 In Tasiilaq, East Greenland, you will find the hike through the Valley of the Flowers. It is an easy hike that follows the river’s meandering course through the lush valley. The valley has both large and small lakes that are particularly amenable to hikers. The duration of the hike is 2-3 hours. Every town has at least one hill or mountain that stands higher than the others, and of course that is where you get the best birds-eye view of the town and the sea it lies beside. 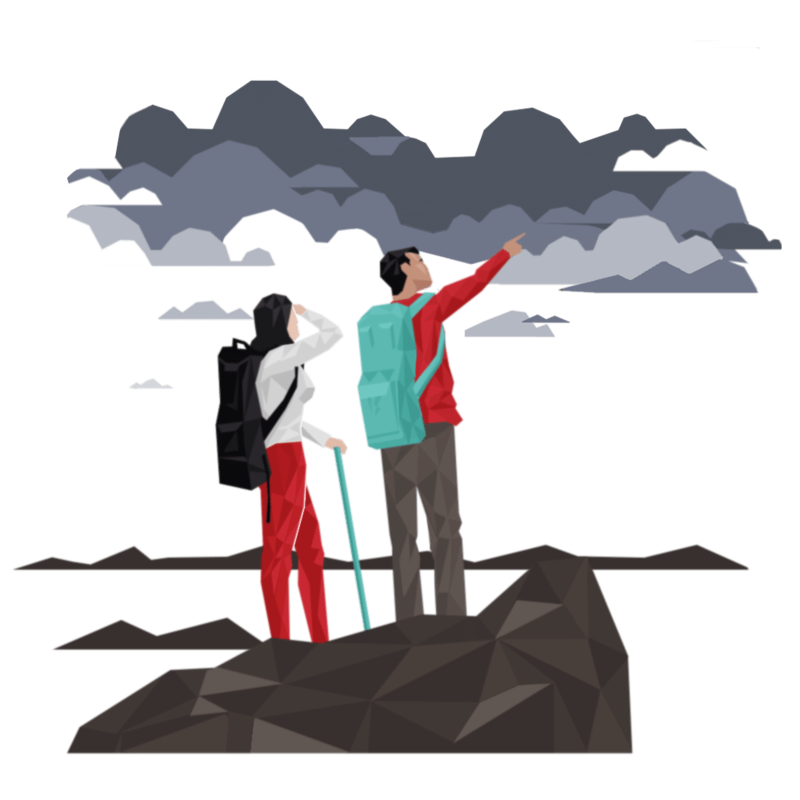 Here is a list of the most common summit hikes for travellers, by town. The most famous trek in Greenland is the Arctic Circle Trail that runs 160 km east-west between Kangerlussuaq and Sisimiut. Approximately 1000 people complete the trek per year, and at the present time, this is only available as a self-guided trekking experience. Get trail notes about the Arctic Circle Trail here. A wonderful guided trekking option in the Arctic Circle region is the 10 day Iceberg Lake Iluliartoq trek where you hike approximately 15 km each day and camp each night. 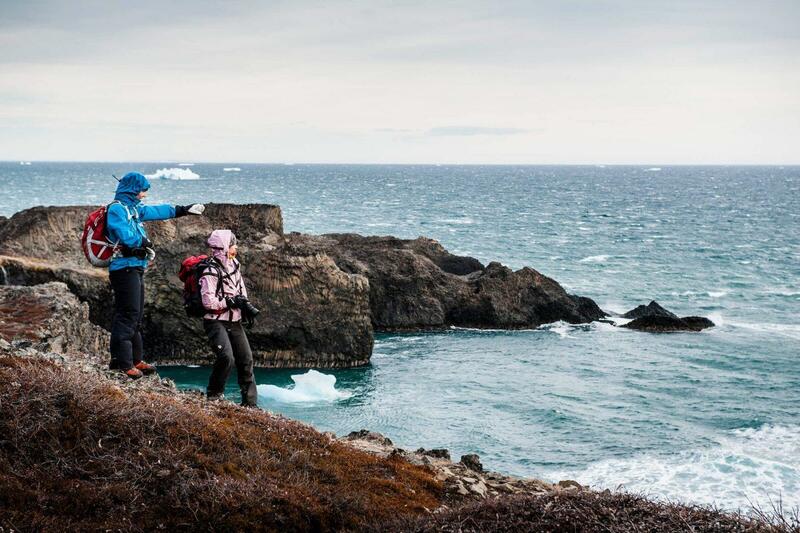 In Disko Bay, the three-day Kangia Triangle Hike takes you along the coastline that flanks Ilulissat Icefjord. This gives the wonderful opportunity to hike in the UNESCO World Heritage Site area and wake up not to the smell of bacon and eggs but to the smell of ice. 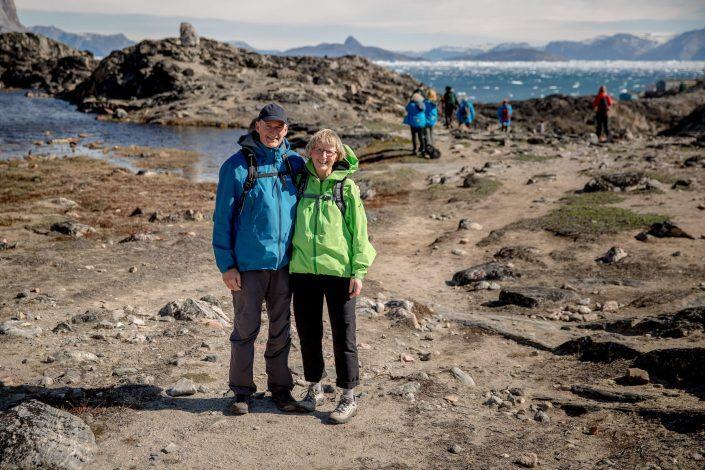 Another Disko Bay option is the Ice24 Expedition mini-trek starting and ending at Glacier Lodge Eqi, a several hours’ long sail north of Ilulissat. This is a combination of hiking and glacier walking with a single overnight in a tent and all sailing transfers and meals are included. In Nuuk, the capital city is back up by one of the most intricate fjord systems on the planet with a snaking coastline to keep you putting one foot in front of the other for days. There’s the opportunity to sail out into the remoteness and then cross 25 km from Kilaarsarfik to Kapisillit, a few days’ route on your own two feet that takes you through high mountains toward the one and only settlement in the fjord. Similarly, you could also start from the capital city itself and take a 120 km route to Kapisillit, the one and only settlement in Nuuk Fjord. In fact, the local sports association puts on the annual summer Nuuk-Kapisillit Run where approximately 50 people run the route over the course of three days. They bring their own food and equipment but stay in large shared tipi tents. At the end of the event, there is a get-together in the settlement and boat transportation back to town. Tasiilaq, the largest town in East Greenland, is located on Ammassalik Island. Most of the mountains in the area are around 3,300 ft and range, in terms of climbing difficulty, from easy to demanding. Day trips from Tasiilaq are available to a wide range of lakes and mountains. There are hiking cottages in the middle of the island available for rent. You can also bring a tent for more flexibility. To rent cottages please contact the Tourist Office. 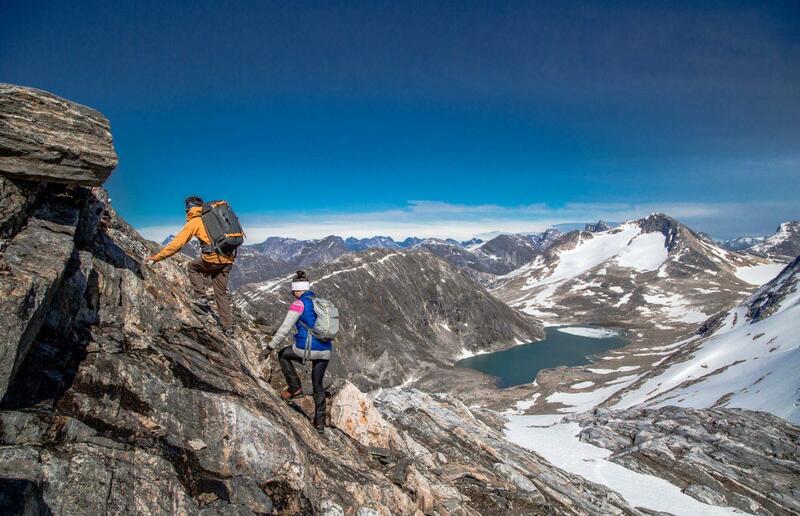 Kuummiut is a settlement near Ammassalik that offers hikes into an area with steep mountains and countless glaciers. The opportunities for climbing here range from easy to extremely demanding. The Ammassalik Fjord splits into two smaller fjords. If you follow Tasiilaq Fjord, you reach a long valley that will take you to the Midgard Glacier at the end of the Sermilik Fjord. The duration of the treks range from 4-5 days to several weeks. We recommend that you contact one of the local tour operators for advice and logistical support for longer trips. 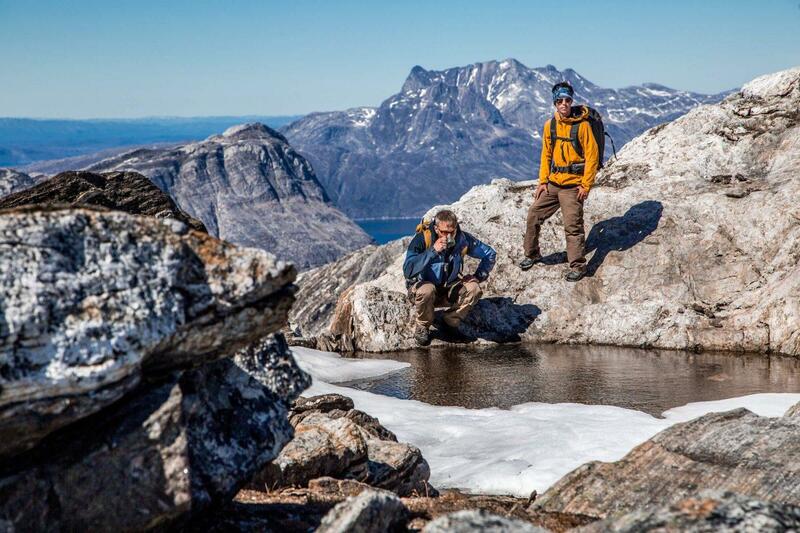 In South Greenland, there is a semi-supported trek called 13 Day Backpacking & Hiking all over the region, as well as an 8-day version between Narsarsuaq and Narsaq. You will have to trek on your own during the day, but you will have accommodation each night at local farms or hostels and in some places, there will be a boat transfer to take you further. 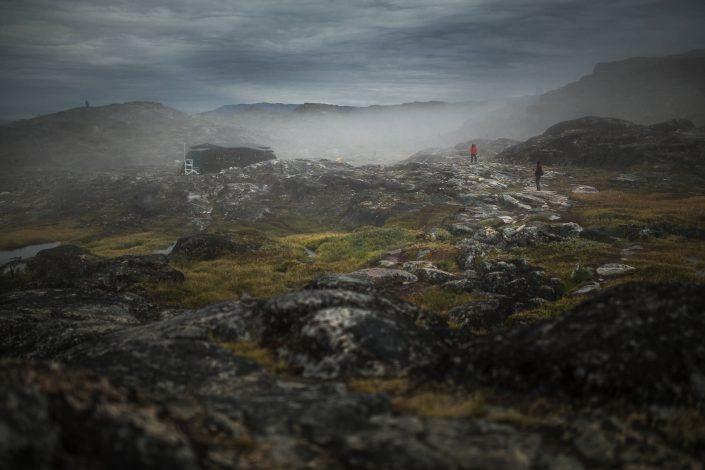 Another semi-supported trek in South Greenland is called Hiking Qaqortoq to Igaliku where a boat transfer is provided at the start and finish, but you will have to trek, camp and cook on your own for 3-4 days. In northeast Greenland, very close to the National Park, there is 7-day boat and sled dog-supported trek around Jameson Land. It follows the trusted route of musk-ox hunters and gives great chances to spot wildlife, everything from muskox themselves to several bird species as well as ptarmigan and hare. 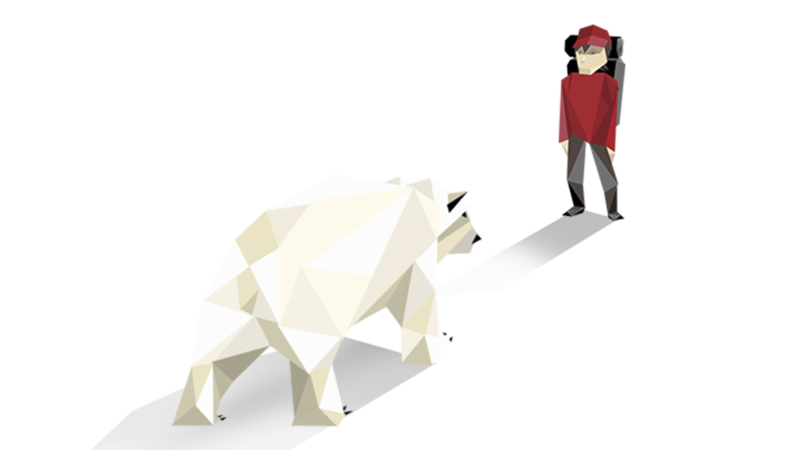 Polar bears are in the area, and therefor the guide will always carry a protective firearm. 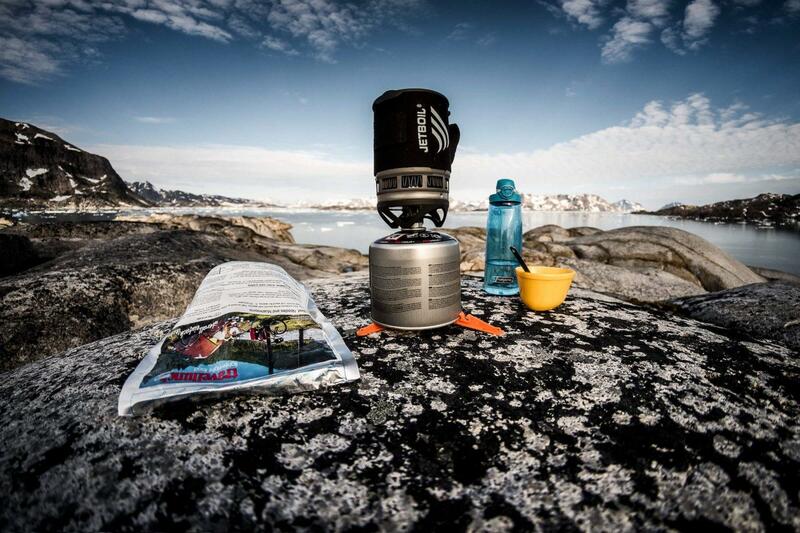 You will camp and collectively cook your own meals each day. Expeditions are serious business anywhere in the world, but especially in Greenland with regards to remoteness. 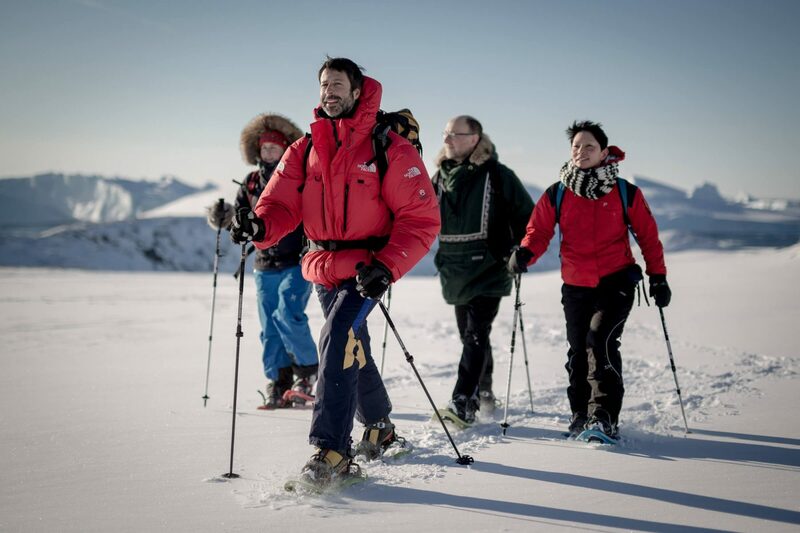 Only highly-trained and experienced professionals should attempt private expeditions in Greenland, and it will be necessary to apply to the Government of Greenland for a Travel in Remote Areas of Greenland permit. Otherwise, booking an expedition through a licensed provider is the safest way to experience hiking in Greenland in its most extreme form. 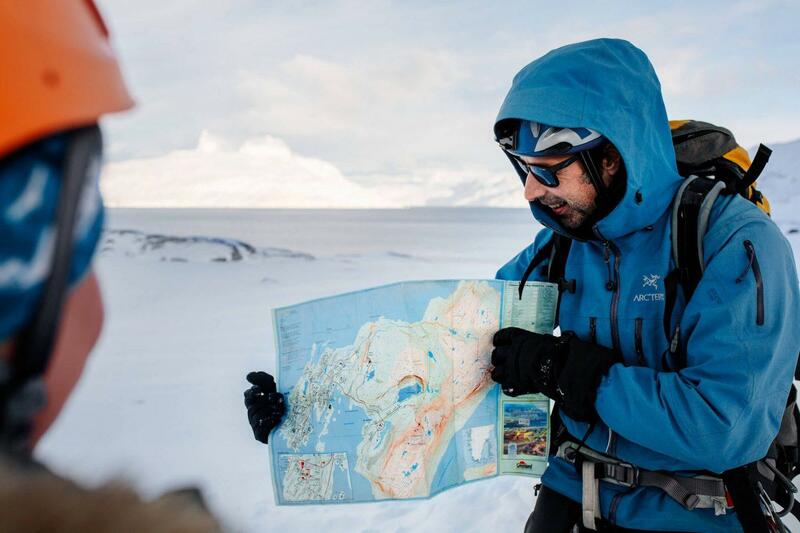 All of the hiking maps for Greenland in 1:100.000 scale and interval of 25m can be ordered online through the capital city’s leading bookstore, Atuagkat. Additionally, they should be able to be found in most tourist information offices. 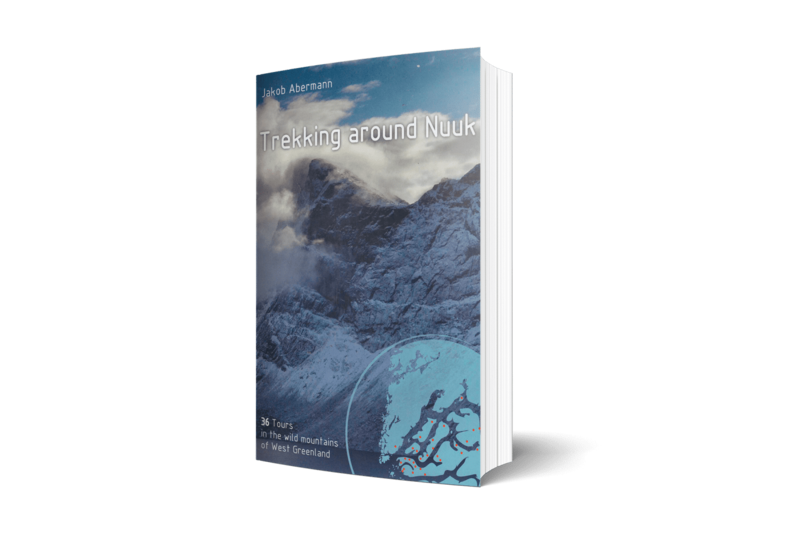 Jakob Abermann, a local Nuuk resident, has produced an impressive book which outlines in detail 36 hikes in and around the Nuuk area. 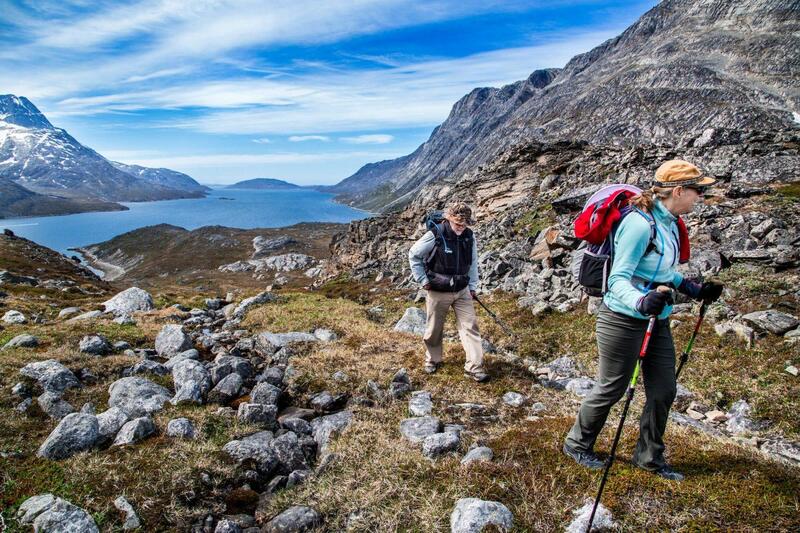 Featured hikes are for all levels and of varied lengths, and take you deep into Nuuk’s intricate fjord system. It is worth bringing an official hiking map with you as well, which will illustrate the terrain in more detail. To purchase Jakob’s book, visit this website or email him directly. With just a few clicks, you can now surf old viking joints in South Greenland or go for a hike in Nuuk! A bookstore based in Greenland, where you can buy physical copies of various maps of Greenland. Online bookstore, based in Copenhagen (Denmark), which sells maps of Greenland. 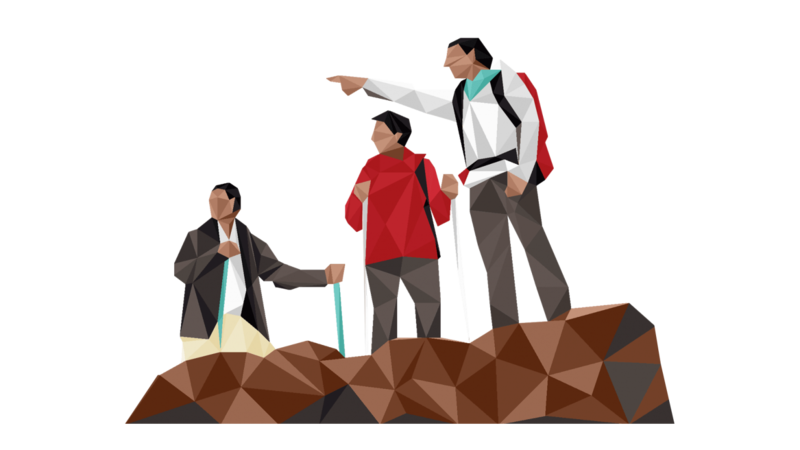 If you are planning to hike alone or without a guide, then familiarising yourself with basic safety precautions is a must. 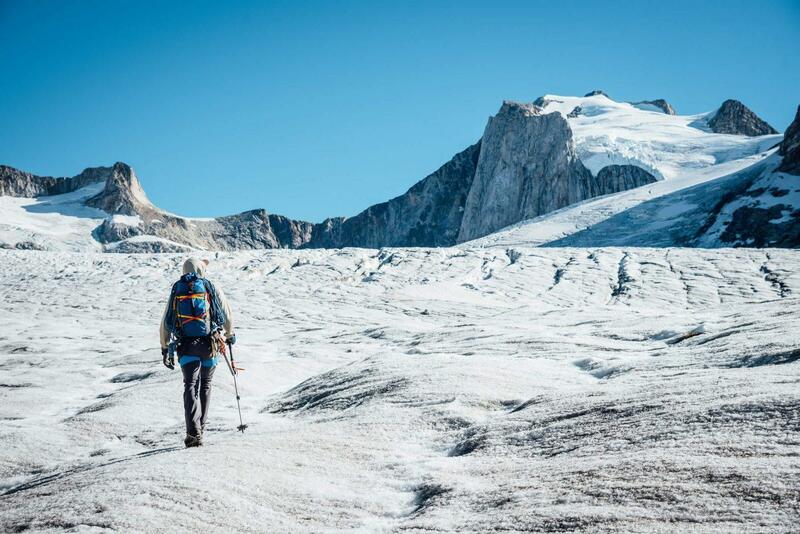 Hiking in Greenland is not inherently dangerous, but the remoteness of some routes and potential weather conditions can exacerbate situations that might otherwise be easily manageable. 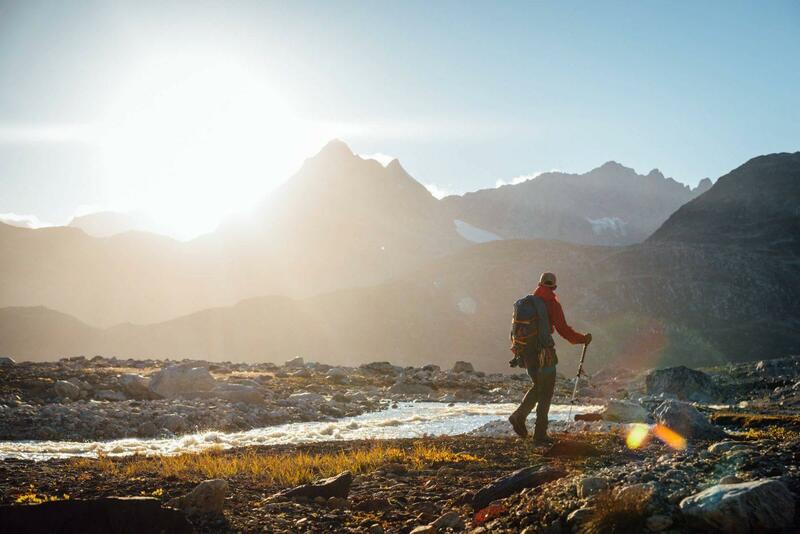 These six long-distance trekkers have no problem hitting the trail alone—and often prefer it. A round up of their best tips for female solo hikers. When it’s time to get away and disappear into the woods for a rejuvenating hike, it’s easy to overlook your most basic needs. Read SPOT Saves featured rescue story from Greenland. 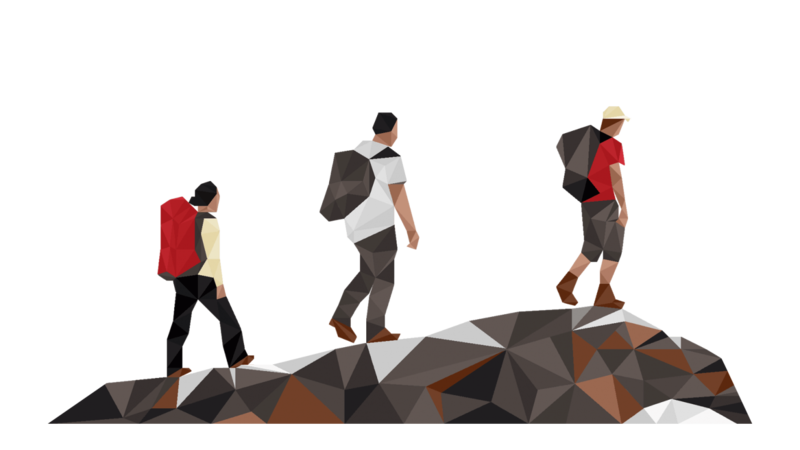 Check out this comprehensive guide for beginner hikers. 2. 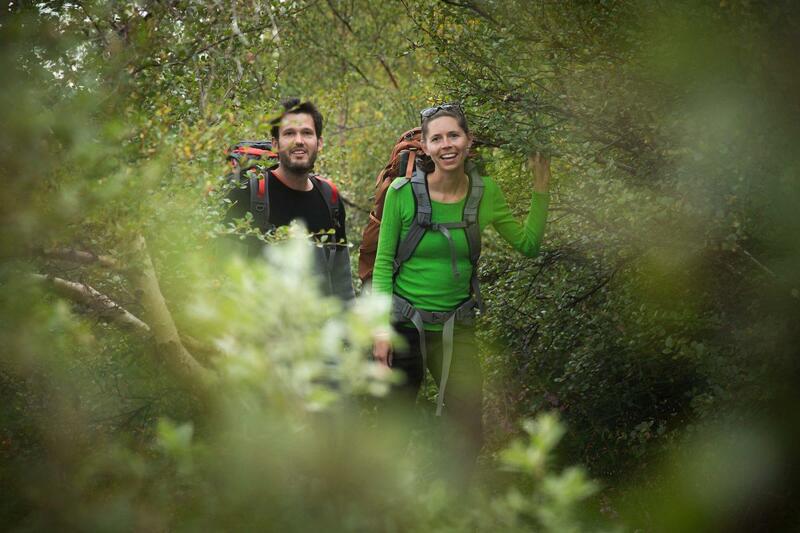 Make sure you remember to submit your hiking route to a tourist office in the relevant area. They’ll then know where you are if it becomes necessary to conduct a search for you. Tell them where you’re staying, where you’re going and when you expect to return. “There is no bad weather, only bad clothing” is so clichéd yet so true. Increase your hiking happiness by staying comfortably warm with well-protected feet. 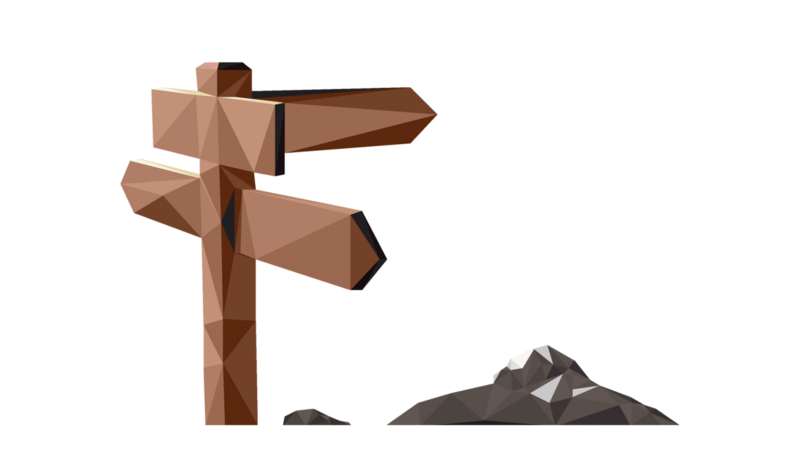 Here you can find useful links about what to pack plus tips on how to choose amongst the sea of options out there. Choosing the right hiking boots is a matchmaking process. 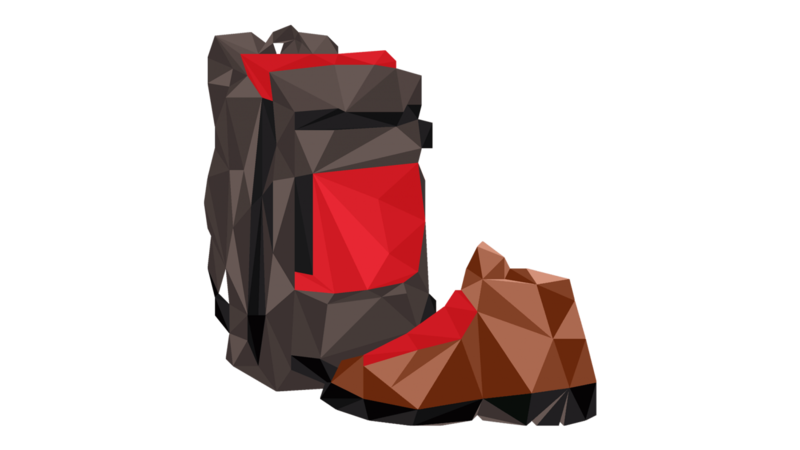 Your dream hiking boots need to sync with how and where you hike. If you are going for hiking so it means you need some essentials so here we tell Top 10 Essentials for Hiking. Jackets help to keep you insulated and dry while on the trail, and ensuring your jacket can hold up in the backcountry is vital. Things happen – you forget your mosquito net or maybe the soles of your boots suddenly fall apart. With this list, you will be able to easily locate where to find replacements no matter which town you find yourself in. (located to the top left at the map bar), in order to see the list of 50 shops selling outdoor gear. Some wildlife encounters are welcome, like spotting muskox on the horizon in Kangerlussuaq or capturing a stellar shot of a breaching Humpback whale. But others are not so welcome, like meeting a polar bear in the far north or in East Greenland. Be prepared to react fast, no matter what the occasion is. 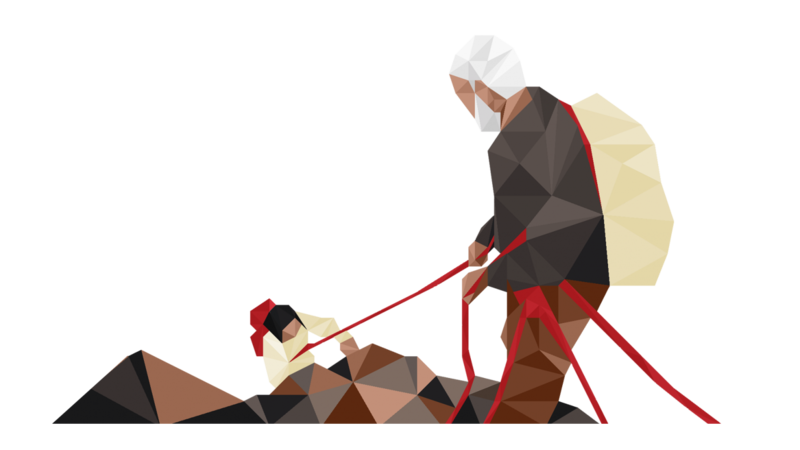 Download a document with guidelines prepared by Government of Greenland. Greenland’s wildlife is rich and extremely diverse. You will encounter it out in the wilderness and on guided safaris. 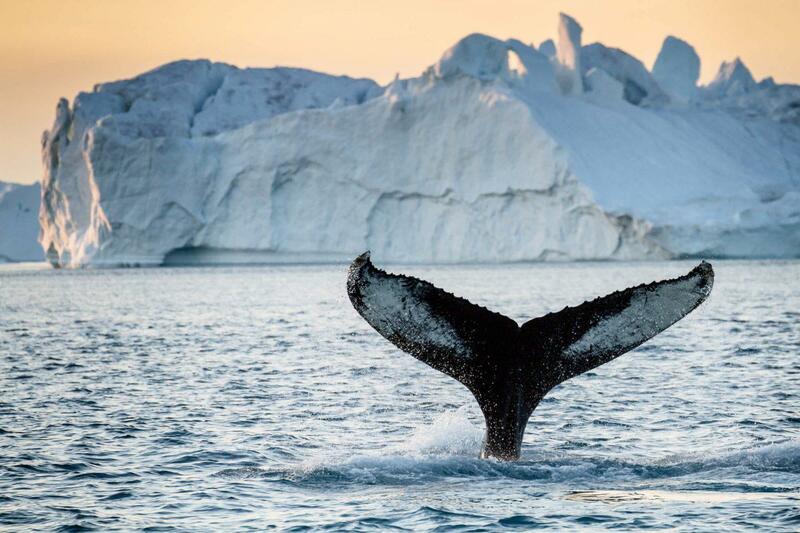 A catalogue prepared by Sermersooq Business Council, that will help you identify 11 of the most known Humpbacks that often visit the Nuuk Fiord in Greenland. 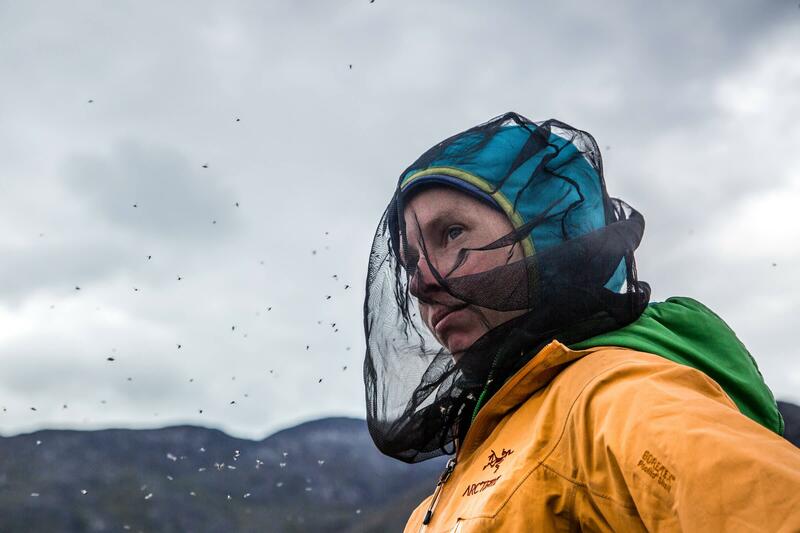 Do be prepared if you visit Greenland during the short but intense mosquito season! The season typically lasts between 4 to 6 weeks. 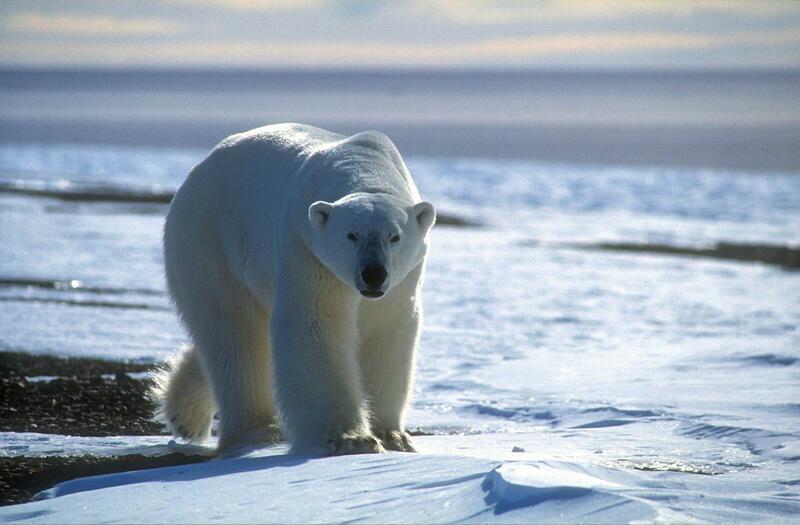 The polar bear population in Greenland is estimated to be sustainable. Around 2.200 polar bears live along the west coast of Greenland, and it is unknown how many polar bears live on the east coast. However, the population is likely similar or larger to that of the west coast. Polar bear sightings in inhabited places in Greenland are generally very rare, but they occasionally come near towns and settlements, attracted by the scent of food. 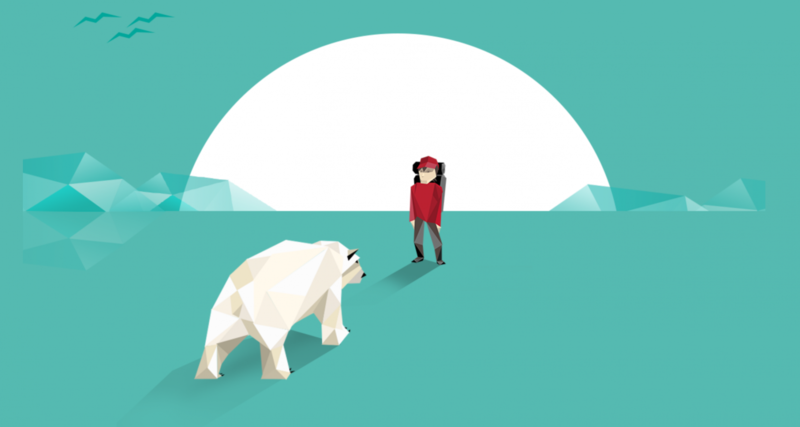 Download infographic to learn more about how you should act when you encounter a polar bear, while hiking in Greenland. Get rid of the Prozac or Adderall prescription, or even the caffeine, and opt for hiking instead. 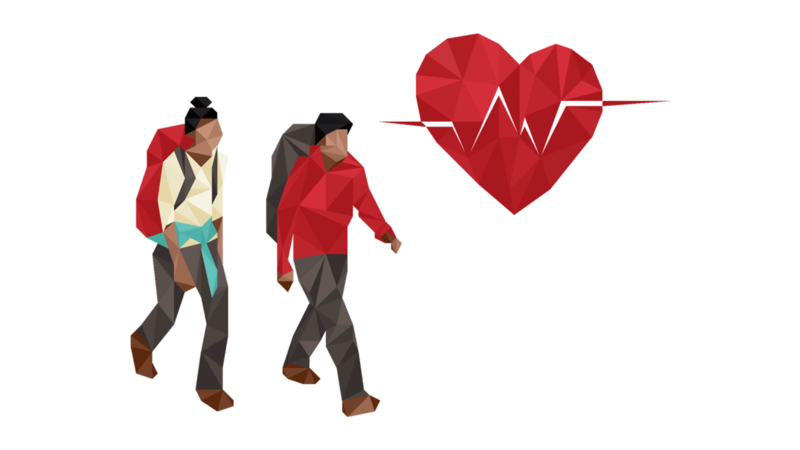 It might sound laughable but there is actually scientific evidence that hiking has health benefits that can make common medicines obsolete. Get outdoors for yourself and for your loved ones. 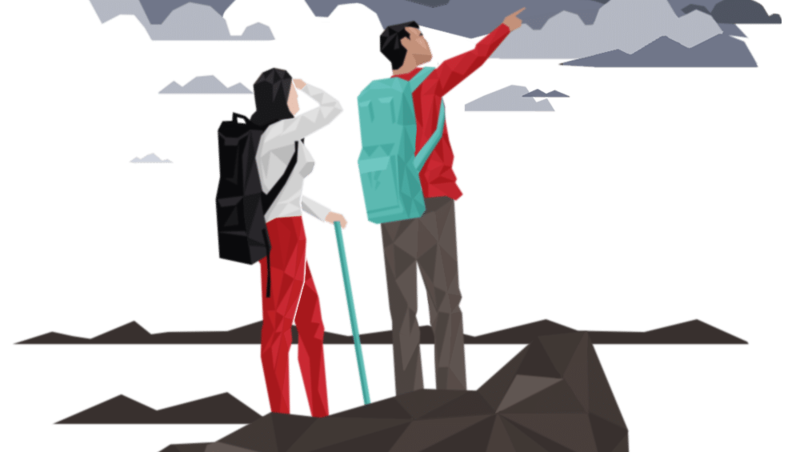 Reading journals about other hikers’ adventures gives you an inside look into a particular hike or trek that no packing list or trusty infographic could convey. 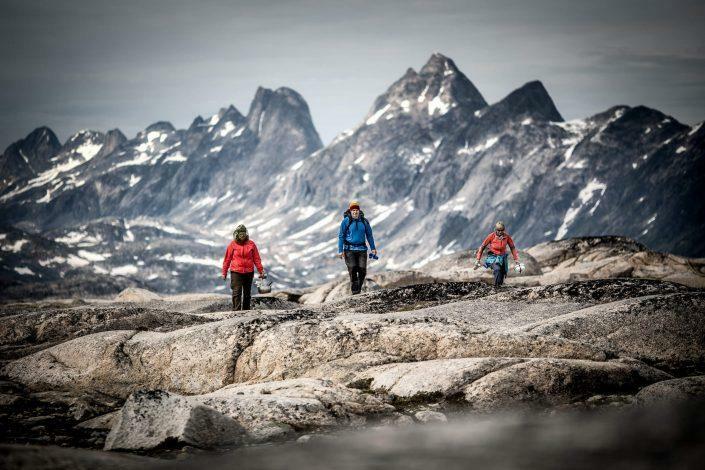 Learn from your fellow outdoorswomen and men in Greenland and maybe pass on your own knowledge after your trip is complete. Good enough to do 2x in 24 hours! If there was an official “Top 10 Things To Do in Nuuk, Greenland” list, hiking Ukkusissaq (a.k.a. Store Malene) would be at the top. Many people have asked me about why I love long-distance trekking, given that the thought of trekking for 8 or 10 or 12 days without a shower or many creature comforts is quite a stretch for most. Kingittorsuaq is proof that there’s BIG adventure in Nuuk, the Arctic Metropolis of Greenland. It is one of the four mountains in the city’s immediate vicinity that most residents know by name. Preparing to hike Greenland’s Arctic Circle Trail? 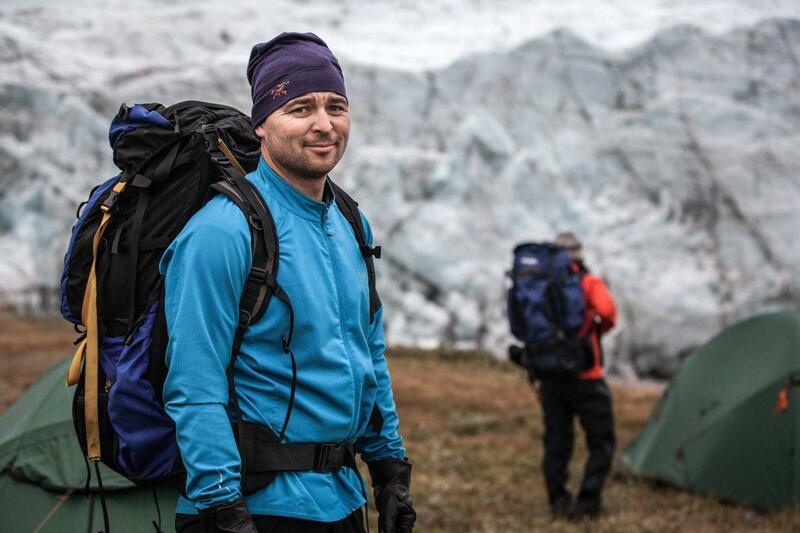 Here are some useful tips for packing and planning your trek based on my Greenland adventure in August 2015.